Ireland may not have had a sprint canoe qualifying for Beijing, but the sport will still be represented by Tom Egan, who by a twist of fate, is manager of the Finnish team. In April 2007, Egan, who has been involved with canoeing for the past 35 years and jad managed both junior and senior Irish teams, got a phone call from the former Irish coach, Martin Hunter. "I had worked very closely with Martin when he was here. He was an excellent coach, but was only able to work here part time at a time with the Irish Canoe Union was looking for someone fulltime," says Egan. Hunter, an Australian who lived in Sweden, had got a job coaching the Finnish sprint team. "He told me they needed a manager for the World Championships in Duisberg, Germany, which was a qualifier for Beijing. I got clearance from the ICU and in Duisberg, we qualified three people - a women's K1 which we expected, and a men's K2 which was a bonus." A few months later, Egan again got the call and travelled to the European Championships where a women's K2 boat qualified. "We have a husband and wife on the team. Jenni, who finished eighth in the K1 500m in Athens, is married to Kalle Mikkonen. He will compete in the K2 500m and 1000m with Mika Hokajarvi. Jenni will go in the women's K2 500m with Anne Rikala." By qualifying two boats, the management team had done exactly what was asked of them and the Finnish Olympic Council was anxious that the team stay intact. "It would have been nice to have gone with an Irish team, but that wasn't an option. 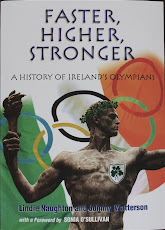 I have to say that I am extremely proud of my club Salmon Leap and of Eoin Rheinish - since 1972, we have had a representative at every Olympic Games." For Egan, Beijing will be a first Olympics. "I've spent a lifetime in canoeing and it has required a lot of commitment. There will be a lot of pressure in Beijing, but it was an opportunity I couldn't turn down - plus we may win a medal!"